The first stamps in France were issued on 1 January 1849. They were part of the Ceres series of stamps to represent the French Republic. They depicted a drawing of the Roman goddess Ceres. France followed Britain in trying to simplify its postal rates system and to have the sender pay. The first two stamps were a black stamp for 20 centimes and a red stamp for 1 franc. As with the penny black from Britain, the 20 centimes black was easy to reuse as cancellation was hard to see. The 20 centimes black was withdrawn and 20 centimes blue was printed to replace it but never used because of a rate change in 1850. Colors caused a bit of an issue at the beginning because the paler 1 franc red (vermillion) was withdrawn because of its closeness in color to the 40 centimes orange. In 1851, Napoleon Bonaparte decreed that he wanted himself depicted on the French Stamps and were used on stamps from 1852 to 1870/1871. 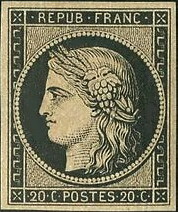 After the wars of 1871, the depiction of Ceres was used again on French stamps until 1875. The printing of stamps was at this time taken on by Bank of France and a new design was used. The Ceres design has been used on a number of commemorative stamps and definitive stamps. The rich history and often turbulent times of France since 1849 add to the color and mystique of French stamps. Not only can you admire the style of French stamps but you can learn and understand France's history.